12 PM ET: #5 Oklahoma at Iowa State Cyclones on ABC – Can the Cylcones repeat last year’s unthinkable feat? Oklahoma is polar opposite to Iowa, but ISU is multidimensional enough where they can matchup well against anybody in the country. I foresee a lot more points being scored, and if ISU wants to keep it close they will need to keep Oklahoma below that 28 number going into the fourth quarter. Remember, the biggest key to everything is the turnover battle. ISU is 10-2 with Campbell at the helm when winning the turnover margin. They are 1-13 when losing or tying it. ISU winning wouldn’t shock me, but I’m going to have to with my instinct here and pick the Sooners. What to expect: Sooners roll the Cyclones in their house! 3:30 PM ET: #12 LSU at #7 Auburn on CBS – Two strong young quarterbacks walk in, who walks out the victor in this SEC battle? Quarterback is a position where Auburn has a definitive edge based on experience, but to my eye Jarrett Stidham and Joe Burrow have very similar games. Good mobility, strong passers. Stidham seems to have the better arm, but I think Burrow may be better on the shorter routes. Against Washington, Auburn looked more comfortable with their drop-back passing game, but they still want to do most of their flying off of play fakes and misdirection. The skill players, backs included, are still more of a function of the offense than the other way around. LSU is going to man up outside and try to deal with the receivers and get after Stidham, and this game may come down to which quarterback can make more plays on third down — which has been a struggle for Burrow to date. There aren’t a ton of dynamic speed rushers on the Auburn front, but they’re an athletic, disciplined bunch and when you get them in third-and-long, Steele can hide his coverages and turn them loose and they’re tough for any offensive line to dealwith. Managing those first down situations to set up third-and-manageable will be the big challenge for Steve Ensminger and LSU’s offense. In addition to the backs and tight ends, this would be a good time to get Jonathan Giles involved with option routes out of the slot. 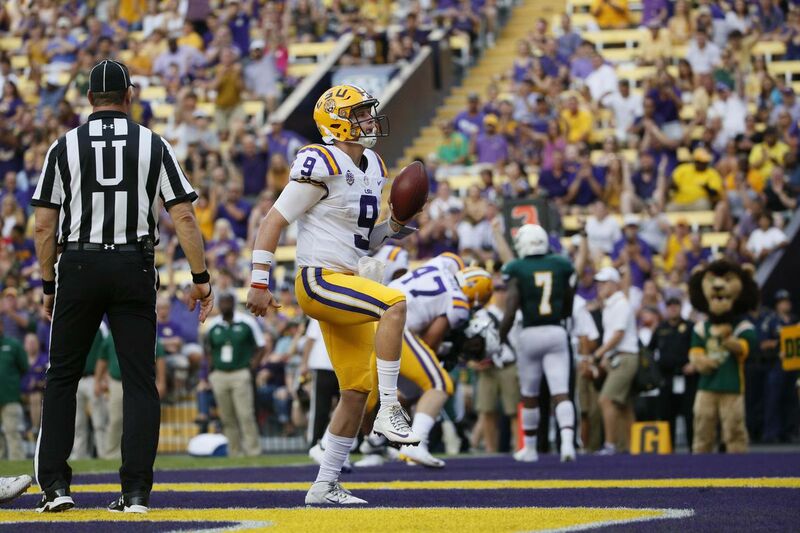 What to expect: LSU is going to get the upset here over Auburn and shock the masses. 3:30 PM ET: #17 Boise State at #24 Oklahoma State on ESPN – If you want offense, these two teams have plenty! Bombs away. Rypien has been very dialed in thus far and if he keeps hitting receivers in stride—points are going to fly up on the board. I’m not quite expecting the same type of WR separation this Saturday that we’ve seen the first two weeks, so he’ll need to be on the money. Surprise them. While this tactic should work well on the offensive side, I think Andy Avalos needs to dial up some surprises on defense as well. Not really a “pick your poison” team with a capable QB AND all-world running back, the Broncos need to confuse the Cowboys in all 3 phases of the game. What to expect: The Broncos defense will do just enough to get this road win but it will be a burner of a game. 8 PM ET: #4 Ohio State at #15 TCU on ABC – Are the Buckeyes over-hyped as 13.5 point favorites over the Horned Frogs? Folks in Fort Worth are feeling a little disrespected by the expert picks in this game. Gary Patterson is a really good coach and he’ll have his defense ready for this showdown. The Buckeyes and Horned Frogs will do battle on ‘neutral ground’, AT&T Stadium in Arlington, TX. Can the frogs make that ‘leap’ to success? In order to have a chance, Frogs O’ War states that Patterson must send in the hounds! For the Frogs to have a shot Saturday, they are going to need to make some things happen. That can start in the Ohio State backfield, where TCU defenders will need to make the acquaintance of Dwayne Haskins. We have been waiting for the Ben Banogu game – the senior defensive end was better against SMU, but you know he’s been waiting for week three to really turn it on. We will also see LJ Collier for the first time in 2018, and he could be a huge difference maker for the Horned Frogs. Corey Bethley, Ty Summers, Brandon Bowen, et al, will need to make tackles, make plays, and cause problems if they want to have a shot of slowing down an Ohio State offense that’s averaging over 60 points per game to start the season. A couple of sacks, a few stuffs behind the line to throw the Buckeyes off schedule, maybe a forced fumble… it won’t be enough to just contain, the defensive line has to shake things up. They’re certainly capable of doing just that. What to expect: This will be Ryan Day’s toughest day as the acting coach of the Buckeyes while Urban Meyer is suspended. With that said, Day has the talent in the program to carry him in this one. Buckeyes win by a touchown. 8 PM ET: #22 USC at Texas on FOX – Can the Longhorns’ defense vault them to victory at home against a ranked opponent? Does Texas have the talent to beat USC and improve to 2-1? Undeniably. That was on full display last season against a far-more-loaded Trojans squad. The question is, can the Longhorns defense look the part of last season’s Texas-USC matchup, forcing pressure on an unproven true freshman passer and preventing the running game from finding its footing? Can an offense without potentially its top running back establish a rhythm and allow the passing game to produce some big plays? Far more important to the outcome, can Texas not get in its own way and help USC get a win? After seeing Texas do exactly that against Maryland, and nearly do the same against Tulsa, it’s hard to believe it until you see it. What to expect: It’s not the “Trilogy Hype Fest” that major networks are trying to sell us on. I mean, come on, Vince Young vs. Matt Leinart was 13 years ago. Longhorns coach Tom Herman will fight hard but that first win over a ranked team won’t come Saturday.